Cranberry sauce adds zesty twist to these otherwise ordinary meringue cookies. 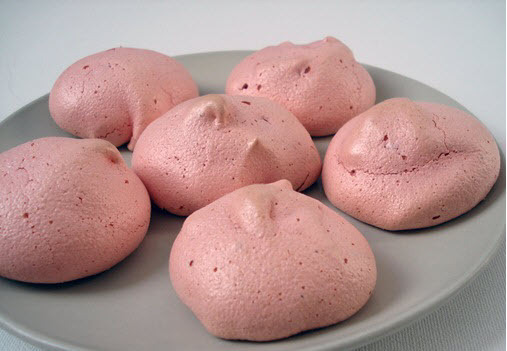 Here is an easy dessert recipe for Cranberry Meringue Cookies. Preheat oven to 200°F. Set racks in the upper and lower thirds; line 2 large baking sheets with parchment paper. Beat whites with an electric mixer on medium speed until foamy. Beat in cream of tartar, then gradually add 2 tablespoon superfine sugar; beat until soft peaks form. Add 1 tablespoon superfine sugar and increase speed to high, beating until stiff peaks form. Gradually add remaining superfine and confectioners' sugars, and beat until meringue is stiff and glossy, abut 3 to 5 minutes longer. Beat in vanilla and cranberry sauce. Place meringue to a pastry bag with a star tip. Pipe out 1-inch cookies onto parchment-lined sheets. Bake in pre-heated oven until firm and lightly browned, about 2 hours (do not open oven). Turn off heat and leave cookies to cool in the oven until very firm and crisp, about 1 hour. Cool completely, then peel away from paper. Makes about about 72 cookies.